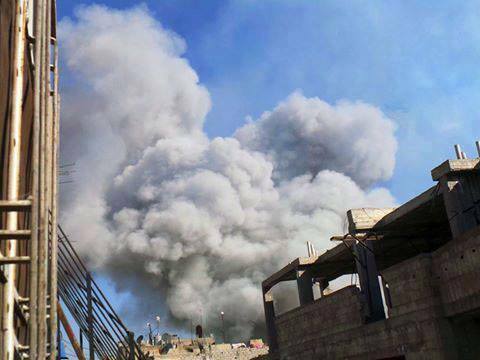 Damascus (Agenzia Fides) – Yesterday the central areas and suburbs of Damascus were hit by intense firing rockets and mortar shells, both from areas under rebel control and from the artillery of the government army. The attack provoked dozens of deaths, at least ten and thirty peopled were wounded in the central area of the Syrian capital. Among the buildings affected there is also a Franciscan monastery attached to the Latin Catholic parish dedicated to the Conversion of St. Paul, in the area of Bab Touma, the old part of Damascus, where many Christian churches are concentrated. “From the first hours of the day – refers to Agenzia Fides, Fr. Raimondo Girgis, OFM – the exchange of rockets and mortar shells were heard. At about 7.30 a shot coming from the rebels hit and devastated the ceiling of the room where Fr. Simon Pietro Herro (current Minister of the Region of St. Paul of the Custody of the Holy Land, ed) sleeps. In that moment – highlights the Syrian pastor – we were in the parish office, downstairs, and Fr. Simone was going to his room to recite the morning prayer”. The mortar shell did not cause damage to the church. “It was a heavy day – said Fr. Raimondo – but in nearly four years of conflict, we have experienced such moments many times. Fear and tension are part of everyday life”. This entry was posted in Institute of the Incarnate Word - IVE - Syria, persecuted Christians, Servant of the Lord and the Virgin of Matara - Syria -, war aleppo syria. Bookmark the permalink.